Buckeye Firearms Regional Leader volunteer Larry Moore was recently recognized by the National Wild Turkey Federation (NWTF) and Women in the Outdoors (WITO) as Hunter Education Instructor of the Year. The award was presented at the River Valley Longbeards annual banquet. Presenting the award was WITO Coordinator Anthony Brooks who noted, "Moore drives here to teach at our WITO event every year. Along with Ten Point Crossbows, Moore instructs and promotes the use of crossbows. We appreciate the support Moore and Ten Point Crossbows have provided to the program. 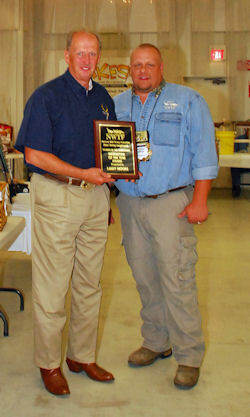 It's this support that makes the NWTF and WITO events both popular and successful." Moore noted, "I really enjoy sharing our outdoor heritage with new hunters and shooters. It's a pleasure to be at River Valley Longbeards and instruct at the WITO event. The WITO committee works hard to have everything organized. It's a great event to instruct. I'm happy to support these efforts. Ten Point Crossbows is also proud to support WITO. WITO is a wonderful outreach program to promote outdoor recreation, conservation and hunting. Thank you." Moore, also an outdoor writer and long-time volunteer leader for Buckeye Firearms Association, has previously been awarded the 2005 USSA Patriot Award and 2007 League of Ohio Sportsmen/Ohio Wildlife Federation Hunter Educator of the Year. Other awards presented that evening included the corporate award to Duke Energy for their partnership with the River Valley Longbeards and the Division of Wildlife for habitat restoration and conservation efforts. Radio show hosts and producers of the Cincinnati Hunting and Fishing Show, Chip and Vicki Hart, were also recognized for their support helping the group host an annual turkey calling contest each year at the Cincinnati show. Newly appointed Ohio Wildlife Council member Tim Ratliff was recognized for his support of Wheelin' Sportsman annual dove hunt the chapter hosts. Ratliff, who is a member of the River Valley Longbeards, graciously helps the chapter by offering dove hunting opportunities for the Wheelin' Sportsmen group at his Brown County farm. All the people recognized are working together to promote hunting and share various aspects of our outdoor heritage. Congratulations to all the awardees for their contributions to Ohio's sportsmen and conservation efforts.